Vineyards in the French Alps probably seems like a novelty or after-thought today to many wine drinkers. Though it's long been on the map, the Savoie region is well below the radar of most wine drinkers, particularly those here in California. But historians can cite with precision many references to wine growing in the Alps and the region's prominence at various times over the past several hundred years. The scourge of the phylloxera root louse took its toll on the Savoie region in the 1870s and 1880s. Mildew then plagued the region followed by World War I. 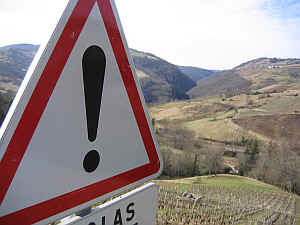 Of course, one can imagine working mountainous vineyards is more labor-intensive than valley floor sites and this didn't help the situation in the Alps. As I understand it, vineyard lands were reduced during World War II as well, but this situation is reversing itself and vineyards in the area are expanding! The major cities in the region are Annency and Aix-les-Bains, along with the famous vermouth center, Chambery. The wines of the region tend to be rather light and delicate, as one might expect of fairly cool-climate sites. The predominant white grape is the Jacqu�re, which accounts for more than half the white wine vineyards. You'll also find varieties such as Chasselas, a major grape in nearby Swiss vineyards. Altesse is another grape found in the region and it's sometimes called Roussette just to keep you guessing. 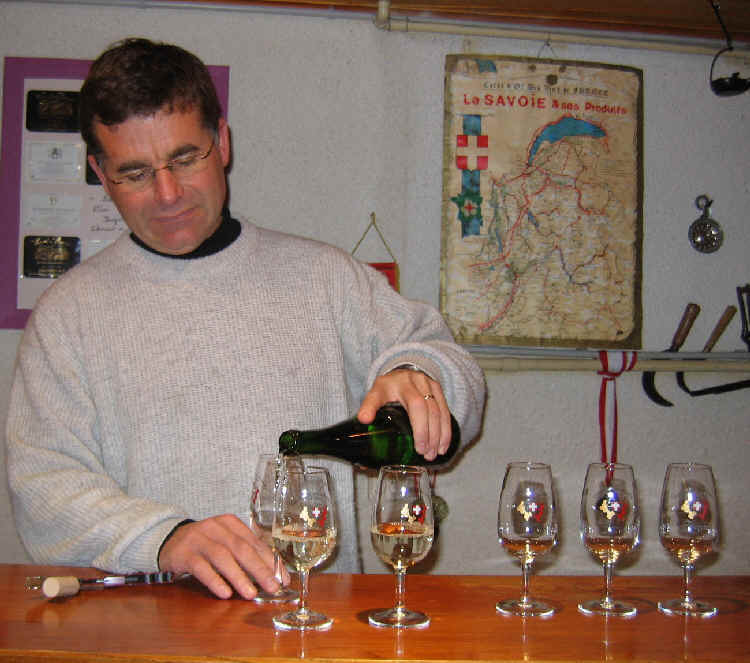 Chardonnay is sometimes found here, as is Aligot�. 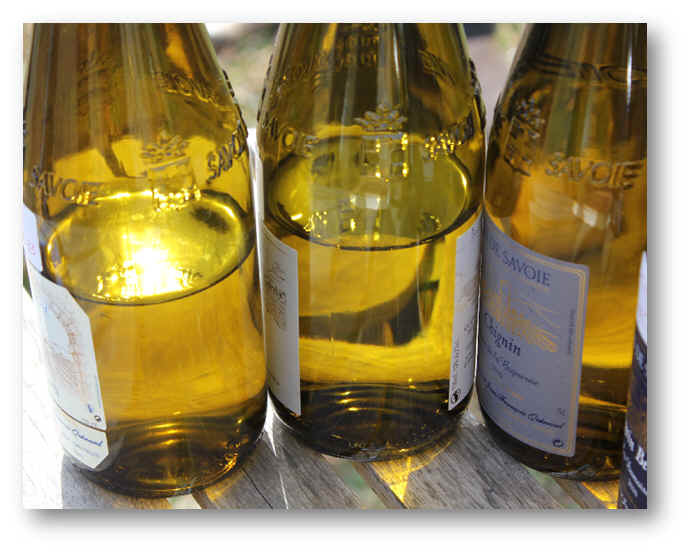 Roussanne, from the Rh�ne Valley, is not uncommon. Mondeuse Blanche (said to be a parent of Syrah and related to Mondeuse Noire) is a rarity, as is Malvoisie. 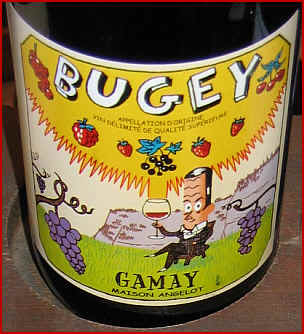 As for red wines, you'll find Gamay has arrived from nearby Beaujolais. Pinot Noir is a bit of a rarity, but it can be found if you look hard enough. 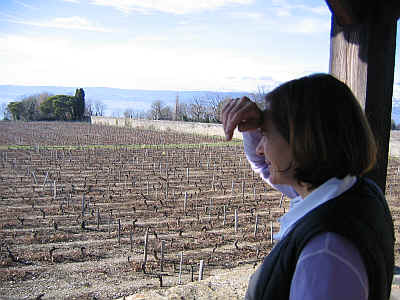 Mondeuse has been the "big" red of the region, both in terms of acreage planted and the body of its wines. Tiny smatterings of an old grape called Persan are found hither and yon, mostly within sniffing distance of Chambery. 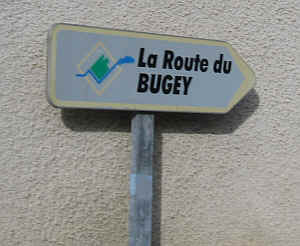 Bugey is another unknown wine region in France. 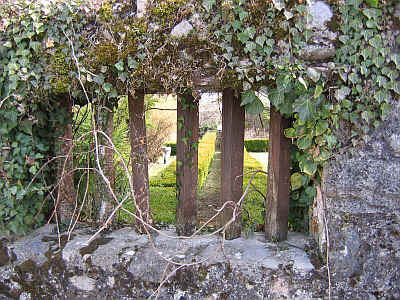 It's located on the lower slopes of the Jura region. 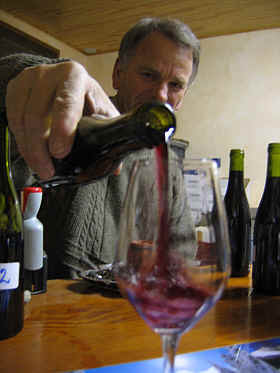 The main red grapes are Poulsard (from the Jura), as well as Mondeuse, Pinot Noir and Gamay. 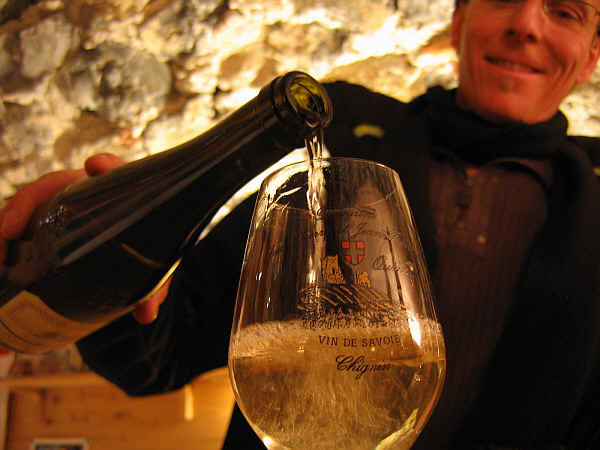 Whites include Jacqu�re, Altesse, Chardonnay, Aligot� and a really obscure grape called Molette. 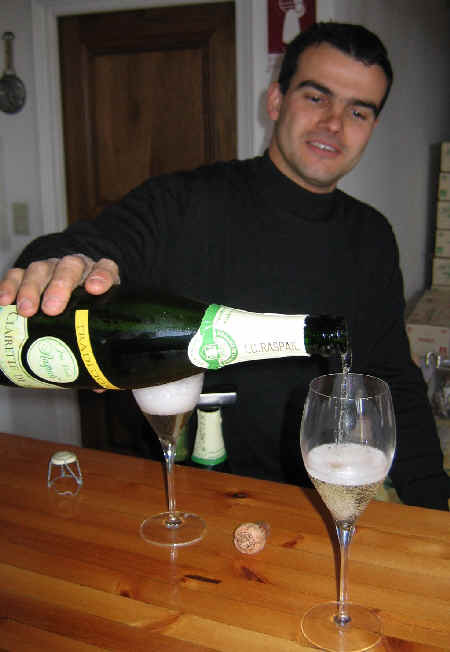 When our friend and wine importer Charles Neal mentioned bringing over a curious wine from the French Alps that was bubbly like an Italian spumante and sweet and pink we figured the poor fellow was "one bottle shy of a full case." This is a most frivolous bottle of wine...it's made in a region well east of Lyon in the Alps but in a locale that's neither the Jura nor the Savoie. We trekked there this past winter and found ourselves pretty much in France's version of the "middle of nowhere." Cell phones don't work there and the few souls who inhabit this landscape must be hermits, for when we asked various folks where the winery of Bernard Rondeau was located, virtually nobody had heard of the fellow! Rondeau has tanks similar to those we see in Italy's Piemonte at wineries producing Moscato d'Asti. 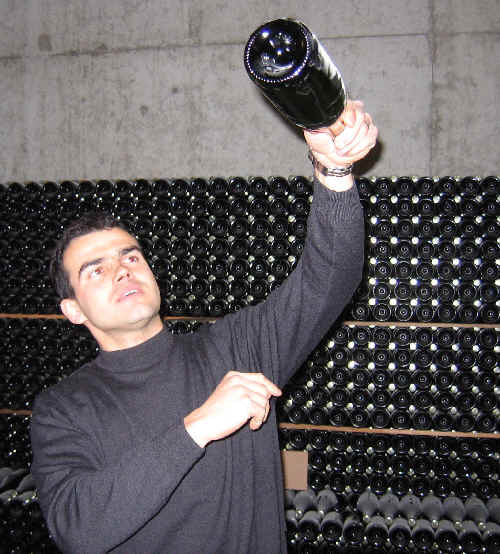 He employs a similar sort of vinification in producing this simple VDQS (Vin Delimit�e Qualit� Sup�rieur) called Bugey Cerdon or Cerdon de Bugey. The resulting wine is pink in color and it's fruity and sweet. When we visited Bernard and his lovely wife Marjorie, they brought out a plate of fried bread dusted with powdered sugar. We've since enjoyed this wine at home with red fruit desserts. The wine is made about 40 minutes' drive from Bourg-en-Bresse, a town famed for its chickens. We drove to a fancy restaurant near there for dinner with the Rondeaus and were pleased to see Poulet de Bresse on the menu. Unfortunately, it has to be ordered two days before. Those chickens must be tough to catch! Most of the vineyards are planted on steep slopes...remarkable terrain for growing Gamay to make a fizzy and sweet wine. Emile, Cyprian and the lovely Victorine. 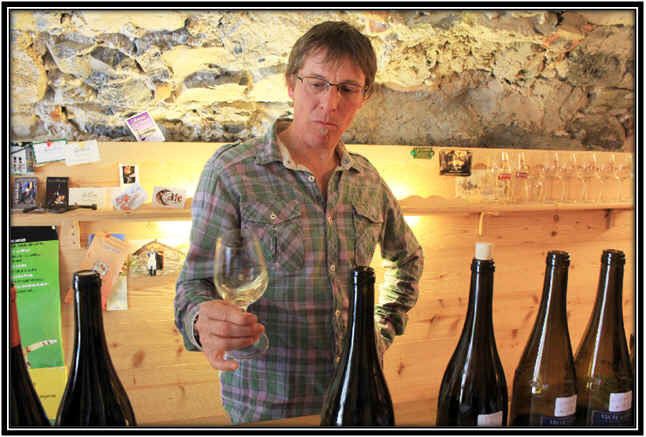 The Angelot brothers cultivate about 57 acres of vineyards in the French alps appellation of Bugey...and they produce a rather nice, juicy, berryish Gamay that's much along the lines of a French Beaujolais. We have the 2017 presently, a delightfully easy-to-drink, simple red. This vintage is comparable to good Beaujolais or Beaujolais-Villages, whereas "normal" vintages tend to be a shade lighter than Beaujolais. The label, above, was their standard packaging for the Angelot wine. Simple, clean, normal. This new vintage is from the 2017 harvest and it's as delicious (maybe more so) than a standard bottling of Gamay from the more famous Beaujolais region. The label depicts all the fruits you'll find in this wine...lots of little strawberries, raspberries and cherries. It's best served at cool cellar temp and pairs well with lighter foods. 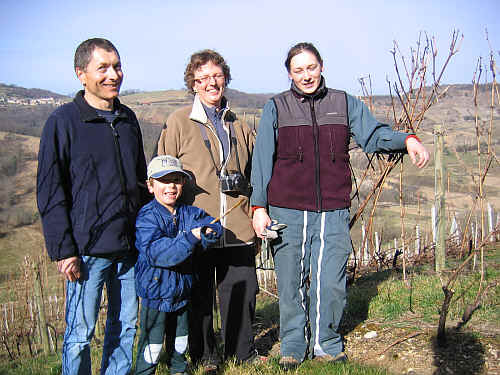 The Angelot boys also dabble in Mondeuse, a commonly cultivated red in the Alps. 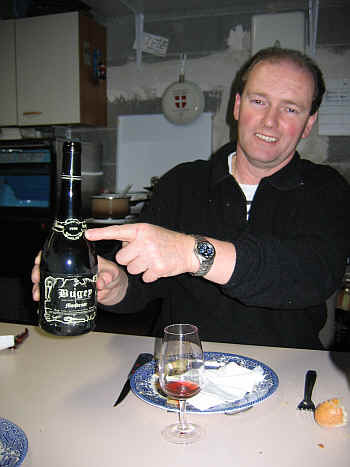 Philippe Angelot shows off an old bottle of Mondeuse. 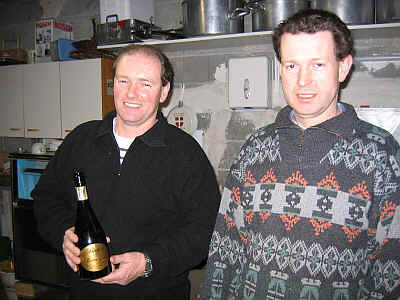 Philippe and Eric Angelot...the Bugey Brothers. The French word "ripaille", if I understand it correctly, translates to "feast." And what a great name for a chateau which was a "get-away" location for the first Duke of Savoy? He must have been some party animal! This guy ended up becoming Pope (back in the 15th century). Of course, if you're going to have a chateau and host friends and visiting dignitaries, you're going to need some wine. Well, rather than have to go to all the trouble of calling someone at Ch�teau Lafite or hope the brothers at the Clos de Vougeot would be willing to send wine to you, why not plant a vineyard and make your own? That's what the Duke did and they've been making wine at the Ripaille estate ever since. The place has passed into the hands of the Necker-Engel family and it's open for tourists to visit and see the gardens surrounding the old domaine. I gather they have some sort of convention facility on the property, as well. The chateau hosts concerts and various exhibitions, too. Thos hills in the distance are Switzerland and Lake Geneva is a stone's throw from Ripaille. There are some 20 hectares of vineyards on the estate and it's planted mostly to Chasselas, with a tiny parcel of Pinot Noir and Gamay. The soils are well-drained and the vineyards sit on glacial deposits. It's right on Lake Geneva...a short hope away from the source of Evian water on the shores of Lac L�man. We actually sell a fair quantity of Swiss wine from the other side of the "lake" and Ripaille's vin blanc is made of the Chasselas grape and is quite reminiscent of (more expensive) whites from Switzerland. 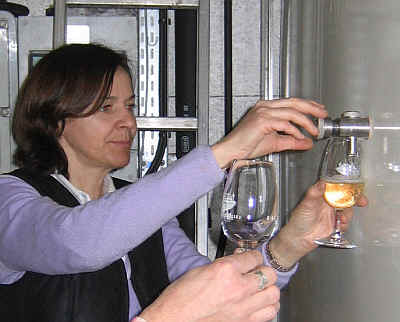 Winemaker Paule Necker offers us a taste of the newest vintage from the tank. 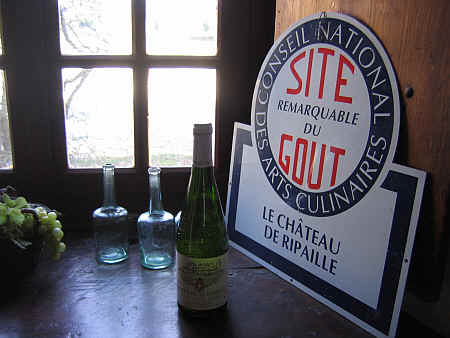 On a cool, crisp winter day, we tasted numerous old vintages of Ripaille's white wine. You wouldn't expect a bottle of 22+ year old Chasselas to still be alive, but their 1985 was remarkable! 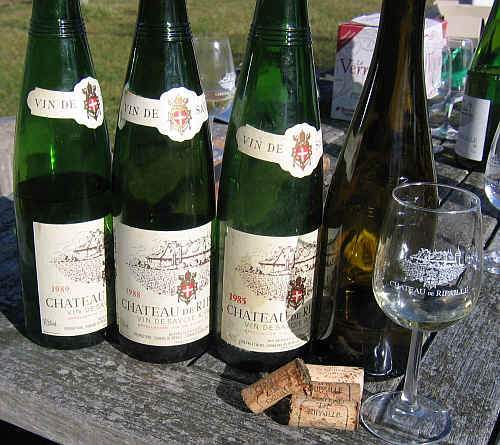 So were the 1988 and 1989 vintages. We have the 2016 vintage in stock currently. This is textbook Chasselas, being a delicate dry white of which oak is not a part of the aromatics or flavor. Fans of sweet or heavily-oaked California or Australian wines are definitely not going to find this to be very exciting. 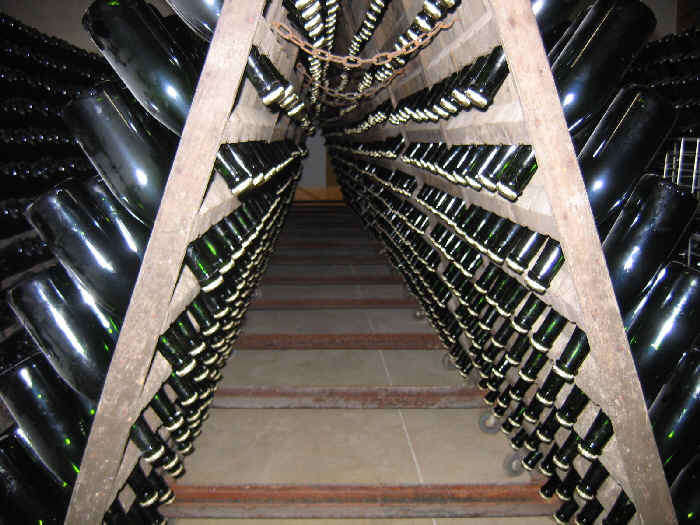 The wine is low in alcohol, weighing in below 12% most vintages. 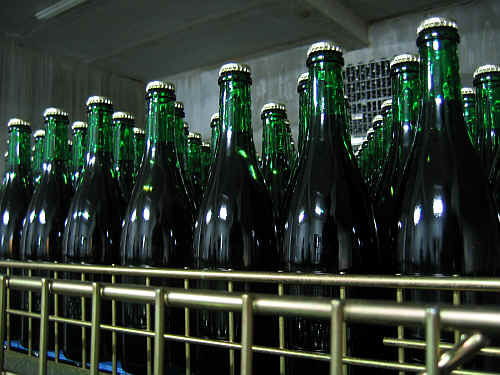 The estate produces about 130,000 bottles annually and we're delighted that a few of them are sent to San Francisco. 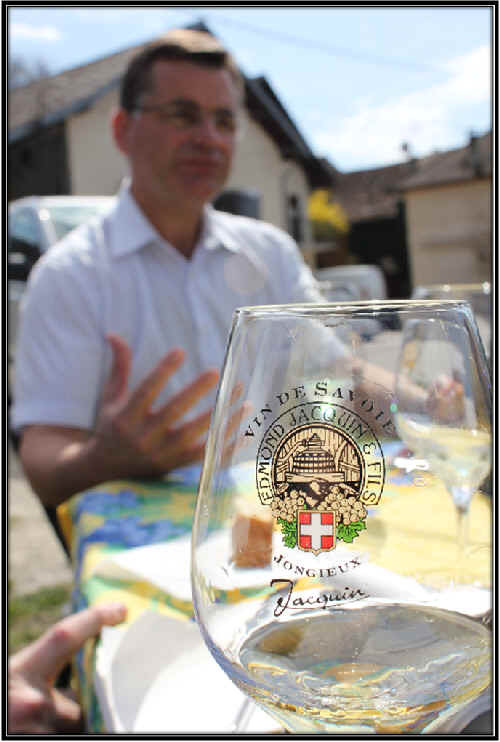 Across the valley from where you will find Apremont wines, one of the (for lack of a better term) more famous Savoie wines, is the estate of the Qu�nard family. Actually, there are a number of Qu�nards that make wine in the neighborhood. You practically need to be named Qu�nard to make wine in this region! 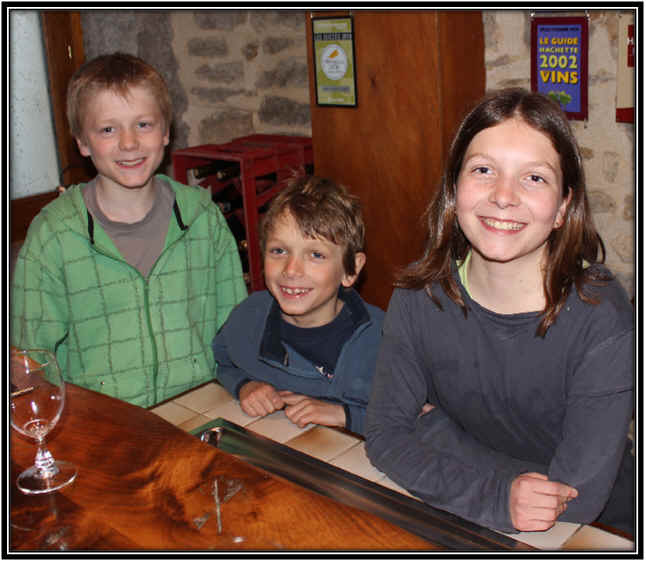 Like the wines of Apremont across the valley, the Qu�nards grow the grape called "Jacqu�re." 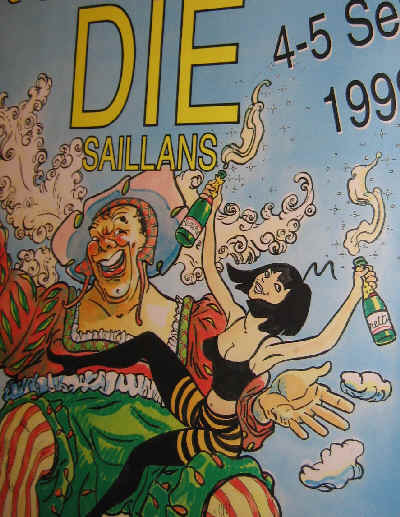 The difference, though, is that the Chignin region has a better exposure to the sun and the wines can be a tad riper, softer and more flavorful (by Savoie standards). It's still not a blockbuster white wine, though. I like the chalky character. 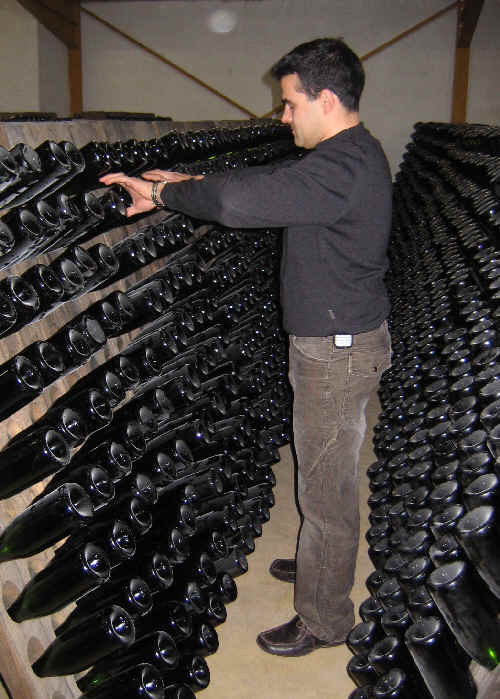 As the fruit tends to be rather acidic, the Qu�nards induce a secondary, malolactic fermentation to soften the wine. It's a satisfying little white unless you have to have oak in your wine. We're big fans of the Chignin Bergeron white wine. This comes from a small parcel of Chignin vineyard land where they grow the Rh�ne variety known as Roussanne. 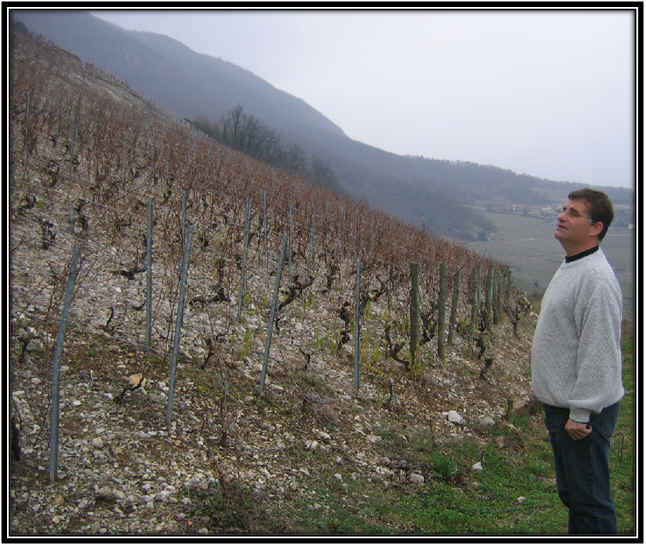 Jean-Fran�ois explains there are but 60, or so, hectares of Roussanne in the region. This is a delicious dry white, teeming with melon, orange and pear-like notes. It's dry, of course. 2013 is the current vintage. Delicious! 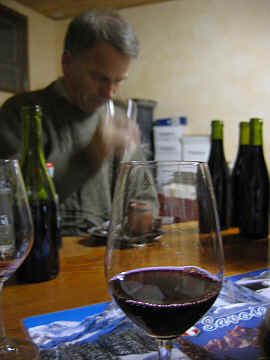 Qu�nard makes a couple of bottlings of Mondeuse (Italy calls this "Refosco"). It's typically a bright, youthful red intended for consuming while it's young. The importer is presently sold out and we hope a new vintage will arrive shortly... It's best served at cool cellar temp, too, please. The Qu�nards suggested a lovely place to dine which also had rooms. It's in the town of Le Bourget du Lac. Click here to see our Savoie-fare. 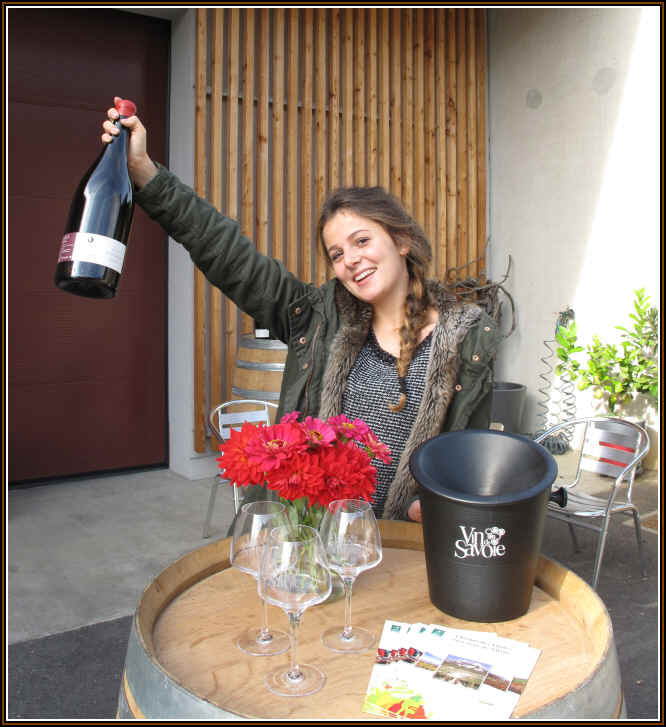 Elisa Qu�nard is enthusiastic about her family's latest vintages! 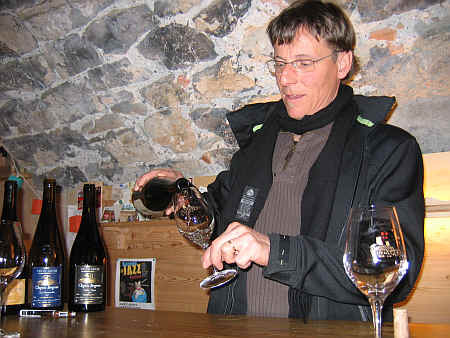 We discovered this winery while dining in the Savoie. I had asked the server for a suggestion of a good, local red wine and she recommended a bottle of Mondeuse from Trosset. The wine reminded me very much of top Northern Rh�ne Syrahs and, in fact, the Mondeuse is said to be a member of the Syrah "family." I don't know if this is accurate, though. Having tasted two vintages of Trosset's Mondeuse, I might guess that there are not too many "degrees of separation" between Mondeuse and Syrah. 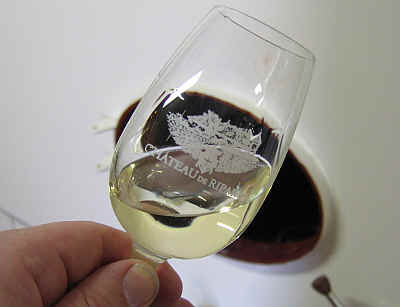 In fact, the "Mondeuse Blanc" is currently thought to be one of the "parents" of Syrah! On the other hand, the grape grows in Italy's Friuli, where it's called Refosco and these are rarely reminiscent of Syrah. California vintners like to call their wine Refosco, but it's not clear what we have in California is the same variety as "Mondeuse." In fact, some say the Refosco of Italy is not related, either! The village of Arbin is a few miles north of Chambery in the Alps. You can, on a clear day, see Mont Blanc from here. 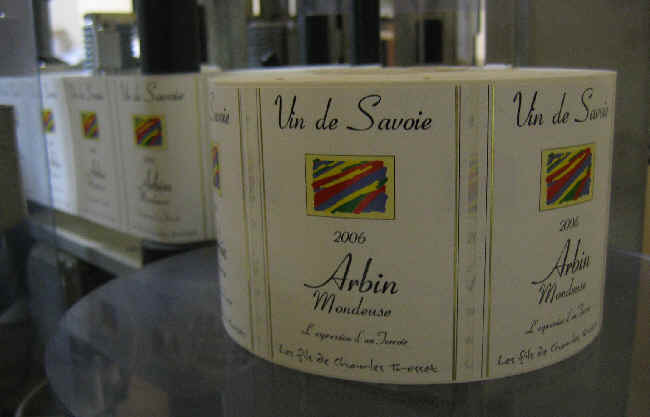 Arbin is, essentially, a "cru" designation for Mondeuse and when you taste this wine, you'll probably understand that if it's this good and so relatively close in character to a nice Northern Rh�ne Syrah, it's probably worthy of this special designation. In terms of aromatics, think of smoky notes, a bit of bacon or hickory and a touch of a green olive tone. The wine is medium-full-bodied and rather elegant. It pairs well with lamb, of course. Duck and beef work well with this and if your pork roast has plenty of seasonings, it will shine with this, too. I have not tasted an old bottle of Mondeuse, so I can't imagine how this will mature. It's so attractive now, anyway. Louis Trosset's real job is as a biology professor. 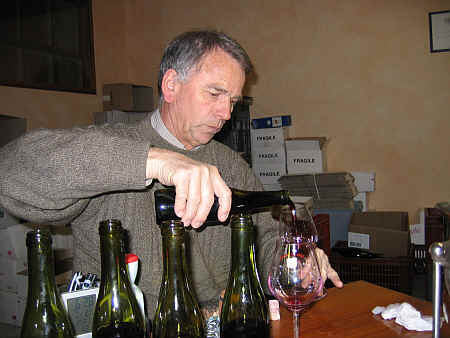 His partner in the winery is his brother Joseph, who works in the French telecom industry. 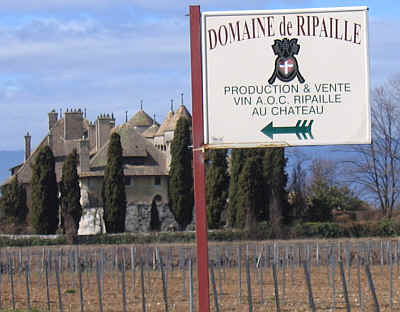 The Raspail family purchased the Domaine de la M�re, a five hectare property. 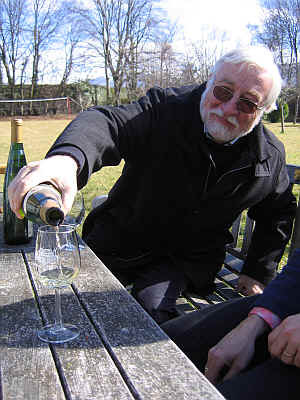 Today the family has 15 hectares and makes sparkling wines as well as some table wines. 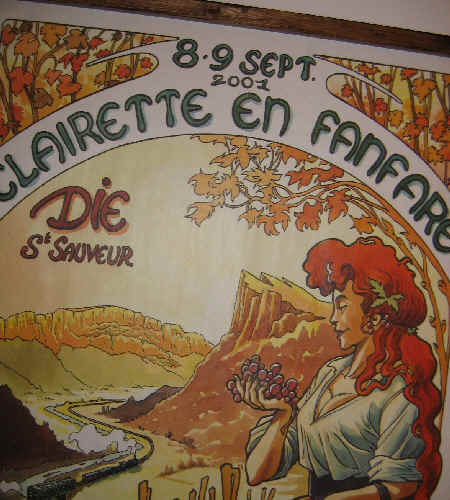 We're especially interested in the somewhat famous bubbly from this estate, a wine known as Clairette de Die. Son and Dad, Frederic and J.C.
Frederic Raspail shows off the wine "in progress." 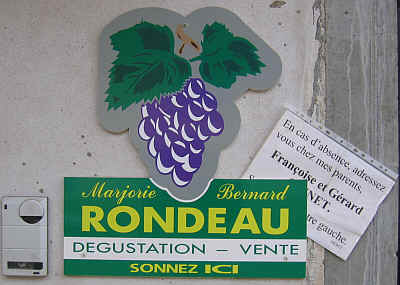 Though the wine takes the name of the Clairette grape, in fact, these must be a minimum of 75% Muscat! The bottles are "riddled" much like Champagne. 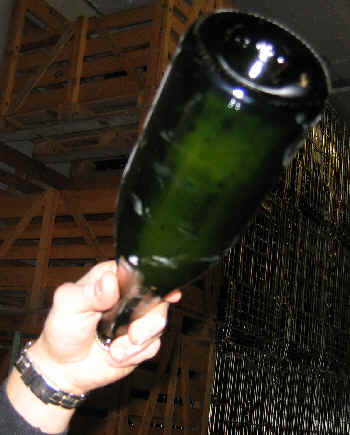 The sediment then gravitates to the crown cap...the necks of the bottles are frozen and then the sediment is disgorged, allowing the wine to be presented "clean." 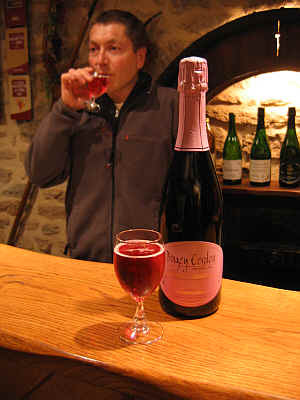 The resulting wine is very bubbly and nicely fruity and floral. It's reminiscent of a handful of well-made Asti Spumante, far more interesting than most of those. The wine is moderately sweet, but elevated acidity contributes a measure of balance to the wine and it's delicious and crisp on the finish. 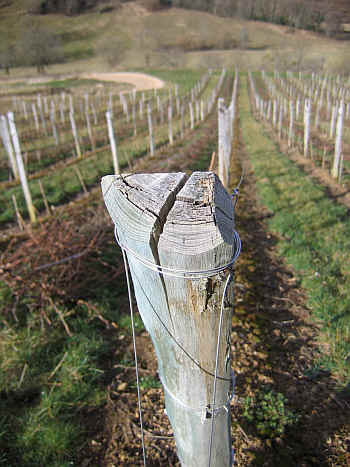 When you visit vineyards in Burgundy or Bordeaux, you'll see fairly flat parcels of vines. Oh sure, in Burgundy, there are some famous sites where the vineyards have a modest slope to catch the daylight, but if you're looking for "spectacular" vineyard sites, a few Northern Rhone locations have more "drama." Alsace has a number of hillside exposures where there are some inclines of note, but probably nowhere else in France do you see such an "extreme" hillside vineyard site than in the town of Jongieux where you'll find the 'cru' of Marestel. And despite its grandeur, it's relatively unknown more than a few kilometers away! It's really rocky terrain, too. The Jacquin estate comprises 22 hectares, or so, of vineyards. 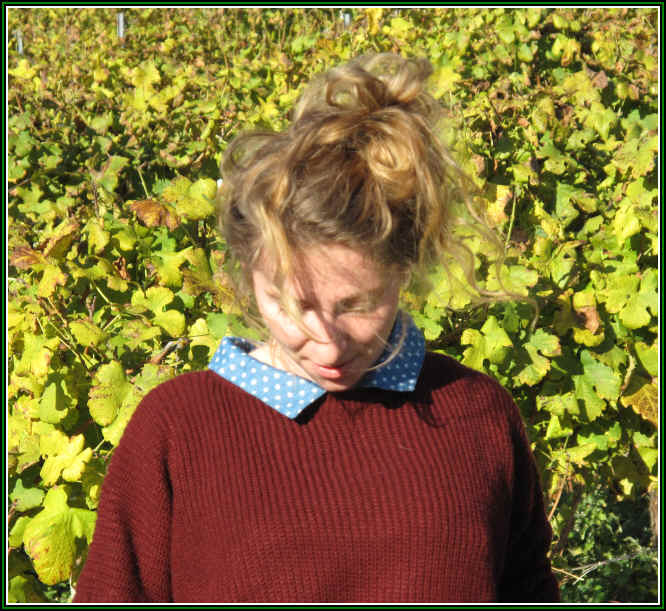 They grow Gamay, Pinot Noir, Mondeuse and some odd variety called Chardonnay. Most interesting, though, is their vineyards of the Altesse grape. 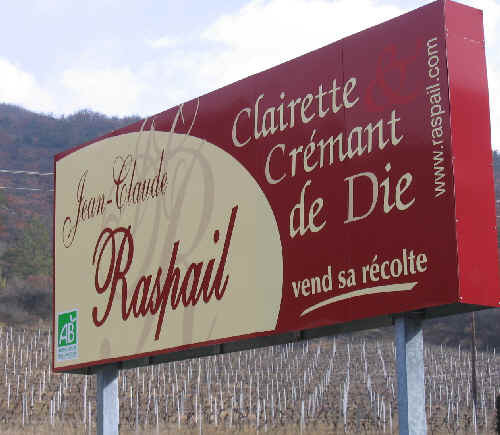 It's called "Roussette de Savoie" and most connoisseurs will tell you to look for the "cru" of Marestel as that's the best. Altesse in this place can make a wine with a wonderfully stony, minerally quality. It's usually a fairly high acid wine and in "the old days" most producers would make a wine with a bit of sweetness to counter-balance the tart character of the wine. Jacquin's is dry and nicely acidic, so pairing it with some fresh crab or a seafood salad makes for a memorable culinary adventure. The wine doesn't see wood and there's a sort of yellow fruit quality here...quince, perhaps? Anyway, $20 will get you into this show and it's a performance well worth experiencing at least once.